Custom Business Card Design for OpenCart - CODELISTPRO | Free Premium Scripts, Plugins, Apps Source Code. 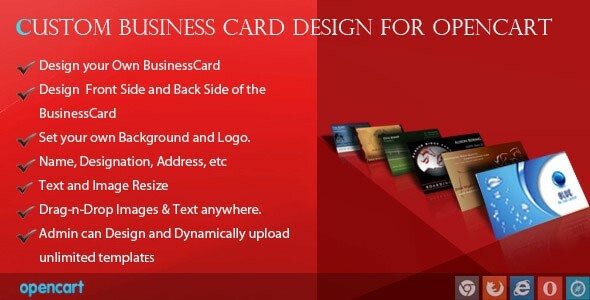 “Custom Business Card Design for OpenCart” module is an open cart module which is used to design or customized business card. By this module customer can design the business card as per their need such as add Name, Designation, Address, Contact Details, Logo and Images by different types of Color, Font, Size and Format. User can also change the Background of Business Card and Add to Cart with Variation Options from Popup. User can upload multiple images and drag the image and text on different positions.